the New York Central and Pennsylvania Railroads. box cars, baggage cars, coal hopper, and RPO Cars. In 2001, the WNYRHS bought two 40' "X-29" style boxcars from the Reisdorf Brothers Feed Mill in North Java, NY. Built in 1927 by a subsidiary of the Baltimore and Ohio Railroad, these well traveled cars were sold to the Arcade & Attica Railroad in 1967 who used them for the shipment of "Creamora" and then sold to Reisdorf Brothers in 1969. Today they are used for storge of Orchard Park Depot supplies, displays and equipment. For over 20 years, our 40' DL&W boxcar and N&W caboose #530306 were on display at the Erie County Fairgrounds in Hamburg, NY. In August of 2014, the Fairgrounds asked us to remove them in addition to a CSX, ex. 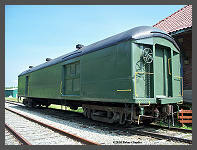 D&H 50' 1960's Pullman Standard built "Operation Lifesaver" boxcar. CSX generously donated their "OL" boxcar to the Society and in September 2014, all three cars were moved to the Heritage DiscoveRY Center. Baggage/REA Car, #2040 ex Conrail #489012, exx Erie Lackawanna #489012, nee Delaware Lackawanna &Western #2040. Built by the Pullman Standard Car Company in 1925. Now on permanent display at our Orchard Park, New York, depot and is used for storage of depot displays. 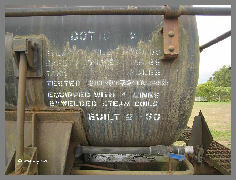 4000 gallon, "Two Dome," Tank Car. 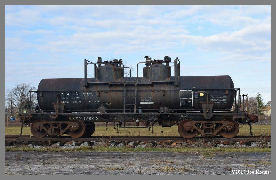 4000 gallon, 100,000 pound "Two Dome" tank car built by "North American Car Company." Built in 1960, it makes this the youngest piece of rolling stock the Society owns. Now on permanent display at the Heritage DiscoveRY Center. in Buffalo, NY.